I have been asked a number of times why are there are so many white authors in certain courses. Of course when I teach about African American Christianity or Hispanic Christianity I do not have a problem avoiding white authors. Many good folks like our own Juan Martinez are now writing in these areas. That was not the case 25 years ago. But the real answer to the question not only historic, but it is really economic. The West has a lot of money, and (like it or not) it costs money to give people time to do good research and then to reflect and to actually write good scholarship. Let me tell you a story. When I taught in Singapore, I was teaching five or six courses a semester. I was literally writing my last lines for one lecture before I stepped into the class. Sometimes I tried to talk slowly because I did not have enough time to prepare a full lecture. Really. During that time I (actually all the Asians also) wrote about, well we wrote almost…well we wrote nothing. Nothing was published for sure. One of the wealthier white missionaries said to me at that time, “You have to get away during the summer to write. “I go to England every summer for a month or two to write.” And I was thinking to myself, “Really? With four children I am just going to fly to England for a month?” Well, that didn’t happen and so I wrote nothing. When I returned to the United States I was shocked: I was to only teach four courses a year! Wow, I have time to read new books and to write articles, and to present papers and to write books. And so I did. I was able to write because the seminary had money. I was in an endowed chair which meant my salary was fully paid for. I learned something very interesting. Writing is a luxury for the individual, but it is a necessity for the Church. This is what motivated me to start an 11 year project to produce a resource for Asian Christian Students, written only by Asians, or people who had taught only in Asia for their careers: The Dictionary of Asian Christianity. Just last Spring I taught a course in East Asian Christianity in the 20th century. I love this course, and one of the reasons I love it is because now there are so many books written by Asians. However, all of these books have been produced in the past 20 years (mostly the past 10 years). Now it is possible to teach a course in Asian Christianity with mostly Asian authors. It is also possible (now) to teach a course in African Christianity using mostly or only African Christian authors. These books sit on my shelf behind me now: Ogbu Kalu, Lamin Sanneh, Jehu Hanciles, Harvey C. Kwiyani, John Mbiti, Lois Farag, Mercy Amba Oduyoye, Kwame Bediako, among others. Just recently, in our own “Missiological Engagements” series we published an award winning book by Wanjiru M. Gitau. Knowing that it is very hard for scholars to have the time to write and publish in countries where the economics make it hard to do research and write, the School of Intercultural Studies initiated a Global Research Institute. Each year we make it possible for one or two scholars from outside the West to come to write and research at Fuller. It takes 20 to 40 years for non-Western scholars to enter into a new scholastic discipline (such as missional hermeneutics, or missional church). At Fuller we need to continue to open doors (and pocket books) to make that happen. But we also need to challenge the newer rich Christians from places like East Asia to make the important commitment to indigenous scholarship. And here is an important footnote: I just approved a new course to be offered at Fuller entitled “Women and Mission: Biblical, Historical and Cultural Perspectives.” Not one book was authored by a male and there are only a few of the readings authored by white females. Things are changing. 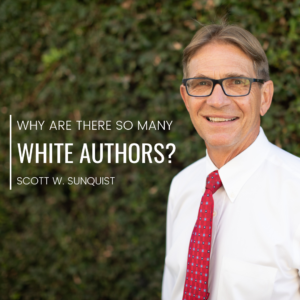 Scott W. Sunquist is Dean of the School of Intercultural Studies at Fuller Theological Seminary and President-Elect of Gordon Conwell Theological Seminary.